Hit the bull when you shop at AwardsandTrophies.com.au for your darts trophies. 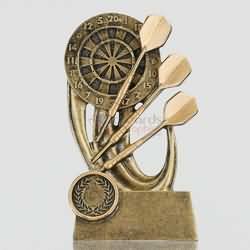 You'll find a great range of darts trophies, darts medals, cups, perpetual trophies & honour boards for your darts champions. Maybe even a sheep or a cow trophy..
SAVE YOURSELF TIME & MONEY ON AUSTRALIA'S BEST DARTS TROPHIES - WITH A 100% MONEYBACK GUARANTEE! You can buy online in just 3 easy steps; simply (1) select your trophies, (2) add your engraving details, then (3) checkout. It's that easy! And guess what - ENGRAVING IS TOTALLY FREE. AwardsAndTrophies.com.au is your complete online shop for all of your darts trophy needs, with free engraving, no logo fees, flat-rate Australia wide shipping (whether it's one darts trophy or 500 darts trophies, our delivery fee is only $9.90) and our Satisfaction Guarantee; rest assured your darts club is in good hands. 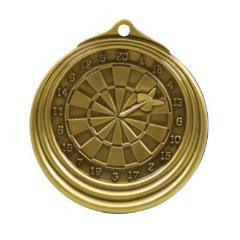 Select from our extensive range of darts trophies, dartboard trophies, and darts medals with your chose of ribbon colour.